Many Les Misérables fans refer to the novel as "the brick." Can you guess why? 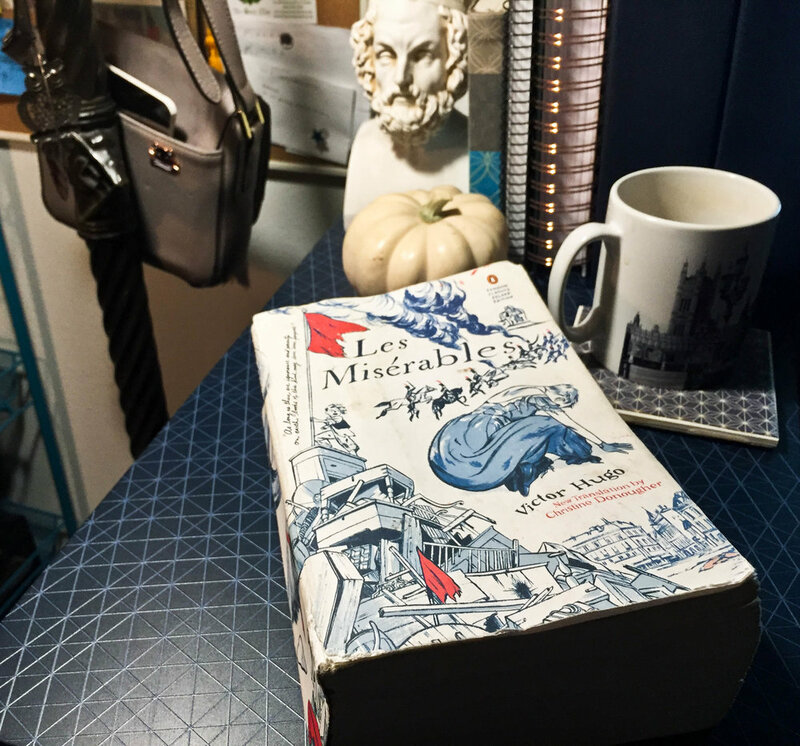 I'm embarrassed to admit it, but I've been "reading" Les Misérables for more than a year now. This isn't because I'm a slow reader (although I often am) or because my life is unbelievably busy. It's because I've constantly picked it up, only to set it aside again when things get slow -- and yeah, things can get slow. Victor Hugo famously gets off track, leaving main characters aside for chapters as he recreates the battle of Waterloo, waxes philosophical about something, or obsesses over the design of the Paris sewers. More than a quarter of the novel—by one count 955 of 2,783 pages—is devoted to essays that argue a moral point or display Hugo's encyclopedic knowledge, but do not advance the plot, nor even a subplot, a method Hugo used in such other works as The Hunchback of Notre Dame and Toilers of the Sea. One biographer noted that "the digressions of genius are easily pardoned". The topics Hugo addresses include cloistered religious orders, the construction of the Paris sewers, argot, and the street urchins of Paris. The one about convents he titles "Parenthesis" to alert the reader to its irrelevance to the story line. These digressions can be interesting and informative, if occasionally offensive ("A little girl without a doll is almost as unhappy, and quite as impossible, as a woman without children." Really, Victor? REALLY?). But sometimes I'm just not in the mood for a dry essay about sewers. I was some fiction! I want some action! I want to know what my man Jean Valjean is up to, and where Javert is lurking! But I'm a purist and a completionist and a literary snob, so I'm not about to skip the dry parts. Instead, I end up avoiding Les Mis and cheating on it with something faster-paced. Still, I keep coming back. Why? For whatever reason, Les Mis has a hold on my heart. Maybe it's my innate attraction to all things French. Maybe it's the compelling social justice arguments that endure more than a century later. Maybe it's stuff I read between the lines. Maybe it's all about Javert; I've always had a bit of a thing for dark, complex, not-exactly-good-but-not-evil-either characters. Maybe it's just a damn good story. All I know is that I've been fascinated by the story since my friend Julia sat me down one night in college and forced me to watch the 10th anniversary performance of the musical on her laptop. My favorite [musical versions of] Javert (Philip Quast) and Jean Valjean (Colm Wilkinson) sing "The Confrontation" in the fabulous 10th anniversary performance of the musical. So, to hold myself accountable and make sure I actually finish this brick book, I'm planning to read at least a chapter a day. The novel is divided into five "parts" -- Fantine, Cosette, Marius, The Rue Plumet Idyll and the Rue St-Denis Epic, and Jean Valjean -- and into several "books" within the parts. Those "books" are further divided into the segments I'm referring to as "chapters." Many of these are quite short, which makes tackling at least one a day a painless prospect. After reading, I'll post a brief blog entry about whatever I found notable about the chapter. These will likely focus on visualizing the scenes, historical facts I learned, or other random stuff I didn't know about 19th century France. Quick translation note, on the incredibly remote chance that both 1) someone is reading this, and 2) that someone is nerdy enough to care which translation I'm using: After a bit of research and reading some sample passages, I chose to go with the 2013 Christine Donougher translation released by Penguin Classics. I read the first couple hundred pages using the old Lee Fahnestock translation, however. Up next: Part Two (Cosette), Book 5 (Silent Stalkers in the Dark), Chapter III (Consult the 1727 Map of Paris).